“It’s been and continues to be a fascinating and rewarding learning experience over the last five years. We are convinced that Passivhaus will continue to grow because it is a WIN WIN WIN situation.” Geoff and Kate Tunstall report on life in the Denby Dale Passivhaus five years on. 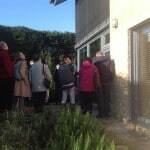 Blog on the Huddersfield 2013 passive house open days, looking at the growth and breadth of interest in the Passivhaus low energy standard. 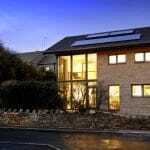 The owners of the Denby Dale Passivhaus share their experiences of living in a Passivhaus through the seasons. This blog is the Spring update. 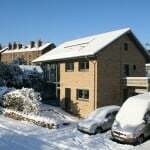 The owners of the Denby Dale Passivhaus share their experiences of their first winter in the house. Living in a Passivhaus: Snow update! Sub-zero temperatures and the house is performing well..Blog by the owners of the Denby Dale Passivhaus. 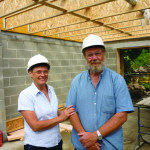 Denby Dale Passivhaus owners write an update for BUILDING on first six months in the house. Blog by Passivhaus owners looking at what it’s like living in the Denby Dale Passivhaus, including update on first quarter’s bills. Blog by Passivhaus owners looking at what it’s like living in the Denby Dale Passivhaus in the summer months. 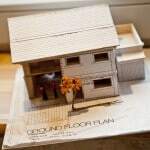 Living in a Passivhaus: Moving in! Moving in and first experiences of sound, light, heat and smells in a Passivhaus! And an almost royal visitor – Witta, partner of Wolfgang Feist, pops in for a cup of tea.